Over the past four years (I can’t quite believe it’s been that long already! ), the principal behind the production of this blog has been quite simple. Each week, I would choose the thing during that week which had been the most exciting or interesting – a concert, a teaching moment, a thought had whilst staring out a bus window, whatever it was – and write about it. I consider myself a tremendously lucky person because not only has something exciting or interesting happened to me pretty much every week over that time period… often multiple things have happened, and I’ve had the pleasure of choosing. I’ve met incredible people, had wonderful discussions with students, heard and seen thrilling and moving performances, been granted the opportunity to read and think and talk about all sorts of stuff. This week, once again, there have been several great experiences I could choose between. But actually, the one I want to tell you about was not at the Southbank Centre or the Old Vic (and I’ve been to both this week). It was not in the classroom with my lovely new students at City Lit. It was not, in fact, in ‘public’ at all. It was what happened when I went to make some elderflower cordial and put it on a table. Allow me to clarify. The cordial was being mixed and made for a private view at The Foundling Museum, where I co-ordinate public programming, for a new exhibition which opened on Friday called Ladies of Quality and Distinction. The show has been very warmly received and has also been written about across the year, as the Museum has gathered images of the twenty-one ‘ladies of quality and distinction’ who helped Thomas Coram to get the ball rolling on his vision of a Foundling Hospital. The men were not interested. The women were – and they, in turn, persuaded the men, who then signed the petition to the King. Without the support of those ladies, there would never have been a Foundling Hospital at all. It’s an inspiring story, isn’t it? And I was excited to see who would end up on the walls of the Museum’s Picture Gallery (from which the men – barring Coram himself – were being removed). All year we’ve been running displays and events around the theme of Vote100, with plenty more to come in the autumn, showcasing the creative talents of women in the arts, and across a whole range of professions in a series called ‘First Amongst Equals’. But to get back to that elderflower cordial. I mixed it in the servery, and put it in jugs, and went through into the Picture Gallery. My first glimpse of the room since it had been repainted, and its walls transformed with the portraits of the Ladies of Quality and Distinction. Have you ever been in a huge picture gallery, resplendent with period features and beautiful chandeliers, and looked around to see almost nothing but women gazing at you calmly from the walls? It was incredibly humbling, and very moving. No one else was there. Just me and these ladies – and Coram watching from the corner. I was quite overcome, in fact, by the sight of them all. Because somehow, even in the midst of all this Vote100 fervour, and with strides made every day in the right direction for equality… and even working, as I do, in history, and in rediscovering from time to time the women who we have forgotten contributed so much to music and the arts… I had forgotten what it could be to simply stand in a room and not be surrounded by portraits of men. It was a curious moment of awareness at how in this particular arena, I was still so used to the dominance of men that I had almost forgotten it was the case. 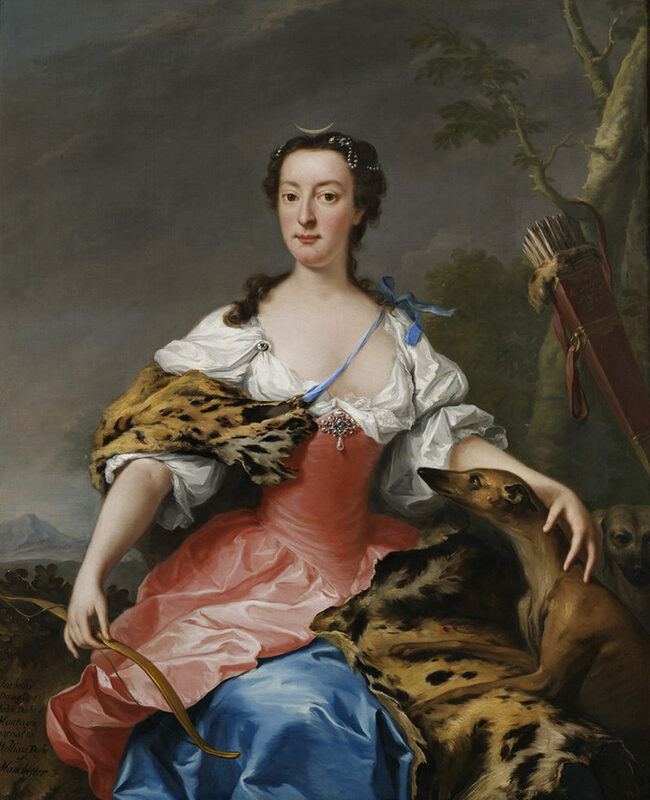 There’s so much to see in the Ladies of Quality exhibition – not just the portraits themselves, but more about the women who helped run the Foundling Hospital across the centuries, and the girl foundlings too. I can’t recommend it enough. But before you go and read the captions, before you get into the historical nitty-gritty, go and stand in that room and look around. Look at those women, and those women will look back at you: eighteenth-century ladies, beautiful and stern, smiling and mysterious. Enjoy the feeling of how unfamiliar it is. Remember that feeling. These women, these extraordinary women, made change happen for thousands of children. If that’s not an inspiration – their actions, their bravery, and their very presence on the walls en masse – I don’t know what is. Brilliant piece Katy. Have only just found your blog. Catching up now on my reading….